We have been cooking with beef recently more so than we usually do. This is because it is the season to eat Lucy’s family’s grass-fed beef. Both Lucy’s farm in Northumberland and Jemima’s in Somerset rear grass-fed cattle. At Lucy’s you will find Galloways and Beltie Galloways and at Jemima’s White Park cattle, funnily enough the two breeds are related. The White Park cattle are magnificent beasts, they are a rare breed of ancient horned cattle. The Galloway is one of the world’s longest established breeds of beef cattle, named after the Galloway region of Scotland where is originated. You can find our Galloway beef in the Ginger Pig (a butcher in London) till the end of October, and you will be able to try out the White Park beef at 5 Hartford Street next year. The reason why this is the season for grass-fed beef cattle (meaning that the cows have spent their whole lives outside grazing grass) is because when the calves are born the best time of year for them to grow well is in Spring, with the best quality grass and good weather for starting their lives living outside. Two and a half years later they are fully grown and ready at the end of the summer, usually through the months July – October. In the years before refrigeration, the beef would then be salted in barrels to be eaten throughout the winter. We love serving steak this way, a glorious big hunk of ribeye, seared so its crisp on the outside and juicy in the middle, sliced up to share with some greens and bread. Very Argentine – we had fun this summer having weekend asados (an Argentine BBQ), a celebration of the country’s iconic gaucho culture and its most prized produce – beef. Every weekend households gather together to share in this feast of fire-cooked meats along with fresh bread and plenty of Malbec. This dish is great because its all prepared in the same pan, after searing the beef the mushrooms are then cooked in the fat from the beef which is delicious. This is just the time of year for Chanterelle which you can find growing in woodland around the country. You can substitute the mushrooms for another kind if you cant find chanterelle – we would suggest something meaty to hold its shape, perhaps chestnut or shitake. Make sure you leave the beef to rest then serve with a green salad. 1. Pre heat oven to 200c Drizzle and generous amount of olive oil, and salt and pepper over the beef and rub in. 2.	first make the fennel puree - lace the quartered fennel in a lined baking tray and scatter over the chopped rosemary, chilli, garlic cloves, seasoning and olive oil. Roast for 20 mins. When out place into a blender, removing the garlic from their skins and add the remaining ingredients. Blitz until smooth. 3. Place a heavy based pan over a high heat and wait till it is smoking, add the beef and sear for 7 - 10 minutes on each side. Take the beef off the heat, cover with tin foil and leave to rest for 15 minutes. 4. Meanwhile add the garlic, rosemary, sages and coriander seeds to the hot pan, add the mushrooms and the wine, cook for a couple of minutes and take off the heat, season and leave to one side till needed. 5. 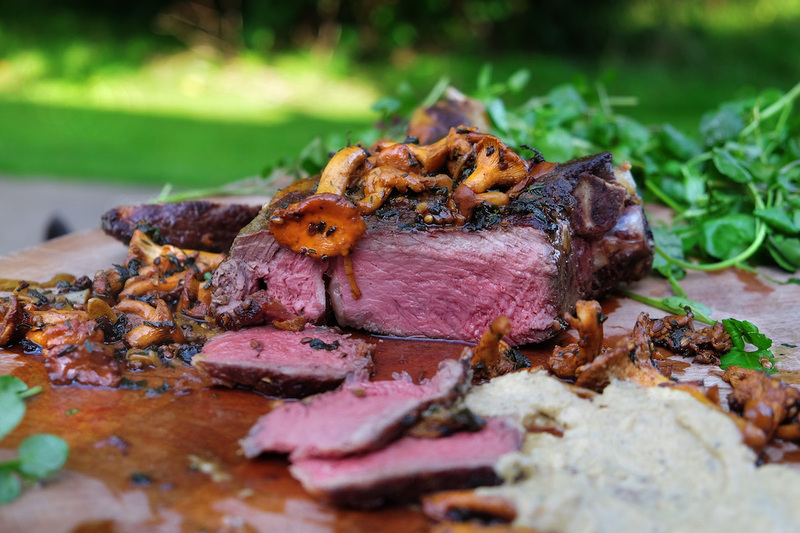 Once the beef is rested place on a wooden board, spoon over the mushrooms and serve with the fennel puree and a watercress salad.